“Hey I’m Katie, I’m 18 and I have Ulcerative Colitis. I was diagnosed in September 2018. I got sent into A&E a few days after my birthday in August. I had no idea what was happening and had never heard about the disease. After multiple scans and tests they found out it was IBD. I had every steroid, antibiotic and immunosuppressant there was (including infliximab) but nothing was working. I was getting increasingly worse until one night many surgeons burst through my door and said I needed emergency surgery because of my toxic mega colon, there were perforations everywhere and I was at risk of going into septic shock. I woke up in recovery with an ileostomy and a mucus fistula. At the end of the day I wouldn’t be here without my stoma, but I have struggled since with my mental health. My number one fear about the surgery was probably how people would take it. It’s quite hard to just say “oh by the way I have a belly bum” and so I haven’t told that many people about it. Only my family, close friends and boyfriend know but I like it that way. Those who I have told have been very supportive. I recently set up an Instagram account @ibdkatie (contains surgery pictures) to share my story, raise awareness and help others. I don’t share my identity on this account, but it is helping me slowly gain confidence. Who knows maybe I’ll go full public someday. My message to those who have just had surgery would be that they aren’t alone at all. 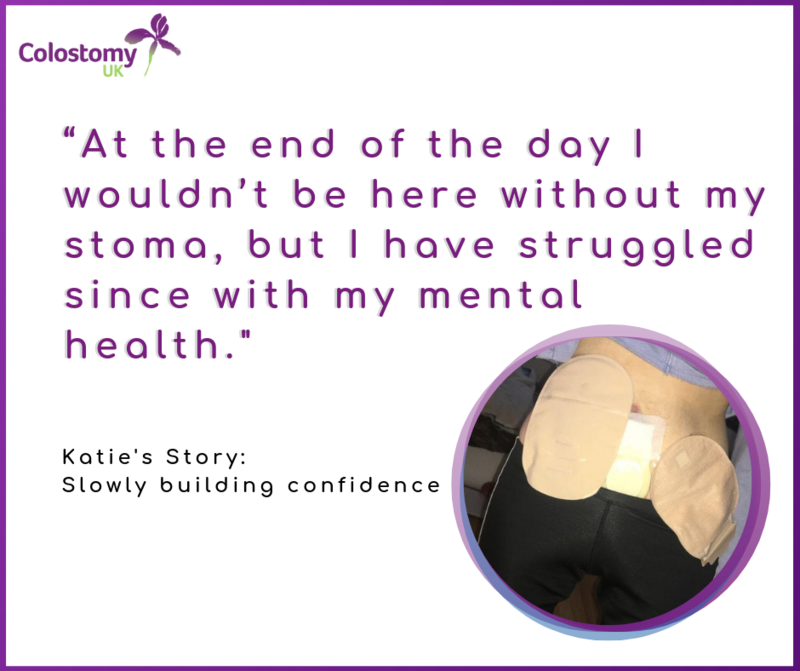 There are many people who they can talk to including healthcare professionals like stoma nurses and counsellors, charities and of course there’s us other ostomates.